Nice Surprises or Intentionality at Work? Since coming back from France, I’ve been assembling a studio space. I bought the black metal easel above originally thinking it would suit my purposes perfectly. I wanted something to fit the space I have, fold up if needed and be sturdy enough to hold the 30” x 30” canvases I envisioned working on. 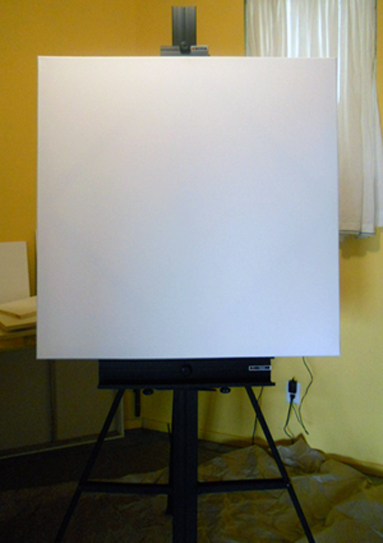 It does fit my current space but I quickly found that it is not as sturdy as I’d like for the larger canvases. I’ve been trying to make it work, make it be okay but it is not. 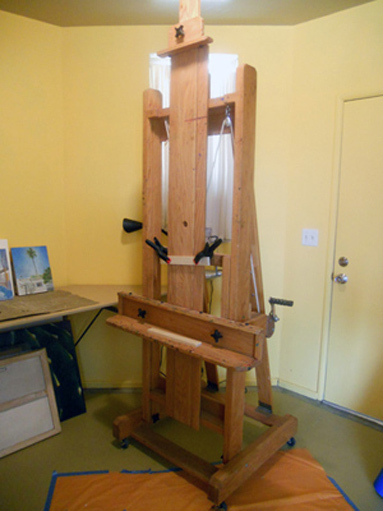 So I went on a quest for an H-frame wooden easel that would fit the above requirements. I was also interested in not just going to the store to buy one but experimenting with the idea of attracting what I want or need into my life. I did some online research regarding various easel brands and prices. I decided what I wanted. I decided how much I wanted to spend. I then checked out various sources such as Craig’s List and eBay. The first couple of ads I checked out were not at all what I had in mind. Time was passing and I was getting more and more impatient with the metal easel. I was about to place an order online when another possibility landed in my Inbox. On one of my online artist discussion boards, there was a post from an artist who could have been anywhere in the world but was only 30 miles from me. She was moving and had no room for her three huge easels. At first, I thought: no way. This was much more than I had in mind, both in size and price. But then I began to think about the future and growing into it. I made her an offer for one of the easels, the exact amount I was about to spend online for a new one. Here it is: an absolutely beautiful, highly professional, extremely sturdy and slightly overwhelming piece of equipment that takes up a lot of space but is a dream to work on. WAY more easel than I had imagined. When I got home with it, the previous owner called to tell me that shortly after I left, someone offered her twice the price I had paid, so she hopes I enjoy it. I certainly am! 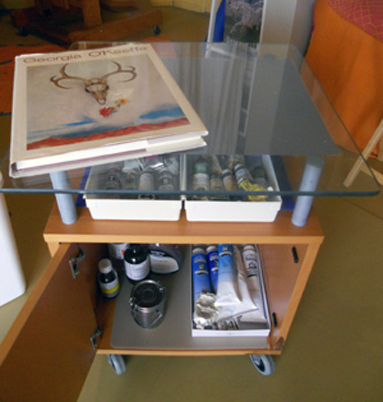 I then went on to ‘request’ a tabouret, a table that goes besides the easel that holds paints and palette. Again, I wanted something to fit my space and my budget, something on wheels, something that I wouldn’t have to worry about getting paint all over. I scouted a couple thrift stores. Then went to the beach on vacation. While walking in town, still with my tabouret in mind, I wandered into an antique store. There, way in the back, way different that anything else in the store and underneath a plastic cake was my tabouret. PERFECT for my needs, complete with a glass top that I can use directly as a palette Voilà. My studio is taking shape. And then an unexpected ‘surprise’. 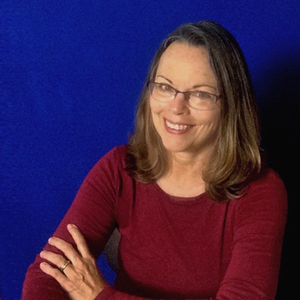 When writing about Georgia O’Keefe last week, I had a deep desire to look at more of her work. I have a few of her books but none of the big picture books that really show the wide scope of her painting. Just a few days later, a friend drops by with a stack of books she had just bought, one of which you see on the tabouret. Another ‘wish’ granted. I write of all this for a couple of reasons. First, having the right environment and tools are so very important. It may not have been logical or reasonable but that metal easel was just bugging me. To feel really good about where you spend your time and the tools you are using adds immeasurably to your experience. Second, this idea of intentionality, of getting crystal clear and focusing on what you want, then taking action expecting to get it is where life can really surprise you.